Production on the Batman v Superman follow-up kicked off in London a few weeks back with all the major players set to return. Ben Affleck's Batman, Henry Cavill's Superman and Gal Gadot's Wonder Woman reunite, working toward the formation of DC's superhero crew: Justice League. It'd be a pretty dull film if they didn't have anyone attempting to thwart their selfless acts of do-gooding. They need to take on a bigger, badder enemy this time around, and it's expected that we'll see them go up against a couple of major villains from the comics. Oh, and as it turns out Lex Luthor, too. While Jesse Eisenberg's name has been kept out of official announcements, the actor himself said he's just waiting to do his part at MCM London Comic-Con. Batman v Superman put a new spin on Luthor's established brand of tyranny, changing him from a scheming, older businessman to a younger, scatterbrained egomaniac. Part of that drastic change is down to Eisenberg's performance that's miles apart from previous live-action turns by Gene Hackman and Kevin Spacey. 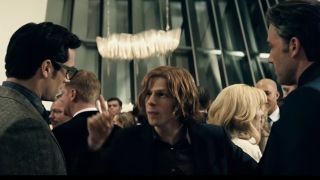 And, while it's always refreshing for actors to make role their own, Eisenberg's Luthor struggled at times to become a cohesive part of the plot. Now we know that he's likely to return, we might get some answers. That deleted scene revealed after the film's release also makes more sense. Titled "Communion" the clip shows Luthor communing with what many believe to be Steppenwolf - the head of Darkseid's armies. Darkseid himself is also linked to the movie, which would turn Justice League into another villain-stuffed superhero outing. What do you think, a good idea? Directed by Zack Snyder and starring Ben Affleck, Henry Cavill, Gal Gadot, Jason Mamoa, Ezra Miller, and Ray Fisher, Justice League: Part 1 is currently scheduled for a November 17, 2017 release.